I boarded a plane on the evening of May 29, 2005 to fly to Hamburg, Germany for a journey back in time. 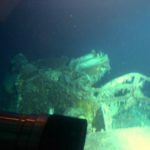 I was going back sixty-four years to the month to visit a grave site that that is almost a mile deeper than Titanic and sadly had a greater loss of life…. 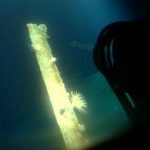 the wreck of the German Battleship BISMARCK! 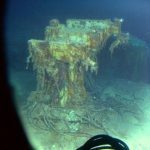 I had originally planned to participate in the Titanic 2005 expedition but a few months earlier, I was able to piece together the puzzle that my third dive to Titanic was aimed at solving. 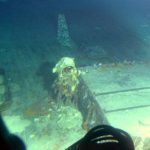 Still yearning for a deep dive after a year of rest (the Russian Mir submersibles did not dive in 2004 due to their disassembly and reassembly as part of the recertification measures periodically necessary to assure their continued seaworthiness), I contacted Deep Ocean Expeditions for their suggestions. 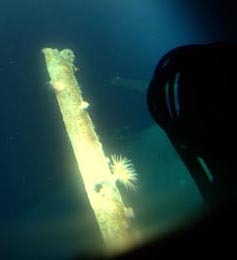 Belinda Sawyer of DOE reminded me that I had passed up the opportunity to dive to the Battleship Bismarck due to a scheduling conflict in 2003 after completing my second dive to Titanic. Although Bismarck had been a ship of war and Titanic had been a ship of peace, there were a number parallels existing between these two maritime tragedies that would be worth probing. The Bismarck, even though bearing the scars of a merciless shelling by the British on the morning of May 27, 1941, this ship was in a more recognizable state than the Titanic and it would be interesting to compare the effects of the harsh abyssal environment on these two ships. 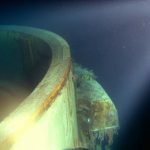 Both ships were similar in size (Bismarck – 823ft / Titanic – 883ft), but the Bismarck lies on the bottom in a single hull section, save about 34 feet of its stern which parted company with the main section of its hull when it plunged to the bottom. Whereas Titanic met its fate only four days after heading out on its first voyage, the Bismarck bettered that record by managing to last just over eight days. However staying afloat twice as long didn’t equate into a lesser loss of life…. when the Bismarck made its plunge to the bottom on the morning of May 27, 1941, some 2,100 souls also followed this ship to their deaths. At 11:12 a.m. on the morning of May 18, 1941, both the heavy German cruiser Prinz Eugen and the battleship Bismarck left their berths on a mission to attack and destroy all traffic on the Halifax convoy route they encountered. Inclement weather and seas were to their advantage and it was their hope that they could break out into the North Atlantic undetected. However, unbeknown to the Germans, their naval communication codes had been deciphered by the British . Their intercepts of German radio messages provided the British with a tactical advantage, and both German ships were detected and encountered as they passed through the Denmark Strait during the early morning hours of May 24th . The British Battle Cruiser HMS Hood, followed by the Prince of Wales, came upon the Prinz Eugen and Bismarck and the British ships opened fire at just before 6 a.m. at a range of 24,000 yards. One of the Prince of Wales shells pierced the Bismarck ‘s forward hull just as the mighty German battleship commenced firing with an opening salvo. After less than a ten minute exchange of salvos, the Bismarck let loose a final salvo at a distance of 19,700 yards and a single shell found its way to one of the Hood’s magazines containing highly explosive cordite propellant, and pride of the British navy ceased to exist in a matter of a few minutes. 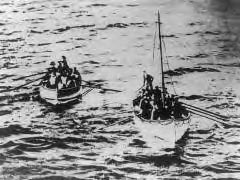 Of the more than 1400 aboard, only three managed to survive. Although this event was a momentous victory for the Bismarck, the German battleship had not come through unscathed in this first encounter with the British fleet. Two of the shells fired from the Prince of Wales in this short firefight had penetrated both the Bismarck’s forward hull and its port side amidships causing serious flooding with the end result being that Bismarck left this battle listing to port and down by the bow in heavy seas. Also not surprisingly, the British having lost the pride of their fleet along with 1400 experienced sailors, put out the cry, “Sink the Bismarck!” to its remaining fleet and set out to carry out that mission at any cost. A few days later, a small group of British Swordfish torpedo planes happened on the Bismarck and one lucky torpedo found its mark, striking the Bismarck in the stern. The resulting explosion tore a hole in the ship’s stern compartments, jamming its steering gear. From that point forward, the mighty Bismarck was doomed. Being able to proceed only in circles, all aboard soon realized that their fate was predetermined once the searching British warships caught up. Early on the morning of May 27th, the final chapter of Bismarck was written. Refusing to haul down its battle flag, the Bismarck became the rubber duck in the shooting gallery pond which, in this case was the angry North Atlantic some 370 miles SW of the southern tip of Ireland and 400 miles WNW of the coast of Brittany. The British fleet moved it, first lobbing high explosive shells onto the Bismarck and then, in the final moments of battle, firing 16” shells at point blank range….so close that many of the shells were actually skipping off the water as they drilled toward Bismarck’s flanks. After firing over 2800 large caliber shells, a torpedo assault commenced and the Bismarck finally succumbed to the sea . It was estimated that some 1500 of the German sailors and officers that were still alive either jumped or were swept into the sea as the Bismarck rolled over and sank by the stern. As the ship rolled, the four heavy gun turrets held in place by their sheer weight, along with portions of the ship’s superstructure torn loose by the British barrage, dropped free and headed to the bottom some 15,700 feet below, soon to be followed by the remains of the ship. The frothing sea was alive with struggling German sailors, fighting for their lives among jagged flotsam and diesel fuel. The British started picking up survivors and had gotten only a few more than 100 aboard when the alert was sounded that a German sub might be in the area. With that, the British fleet steamed away with many of those seeking safe haven still clinging to boarding nets…until the moving sea tore them loose. 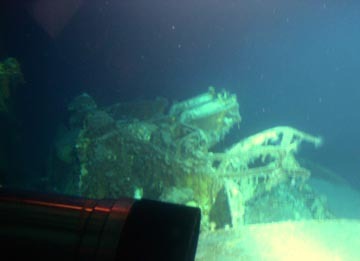 And there the remains of Bismarck and its crew have rested for the last 70 years. Arriving at the site after following the same historic course down the Kiel Canal originally taken by Bismarck but altering our course to take a shortcut through the English Channel, I anxiously awaited finding out where my name would appear on the dive schedule. 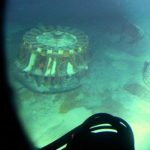 These would be the first deep water dives for the two MIR submersibles since 2003. 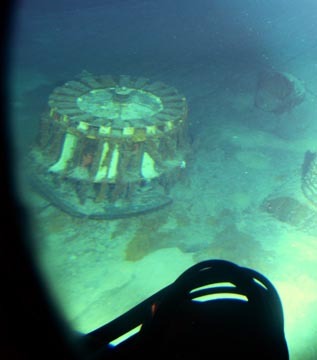 Both submersibles were laid up in 2004 for disassembly and testing as part of their 10 year recertification. My wife didn’t accompany me on this trip, making me promise that I would not be in a MIR on its first dive. 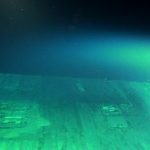 Less than 3 dozen people, including scientists and submersible pilots, have actually ventured to the Bismarck site and I was ready to join their numbers. A mile deeper than Titanic and another ton of bone crushing pressure couldn’t deter me. The dive schedule was posted on June 5 th and Lo’ and Behold….. 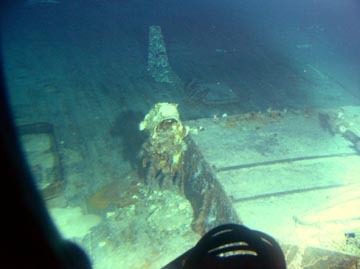 I would be making the first dive with my friend and pilot for all of my previous dives, Dr. Anatoly Segalevitch. 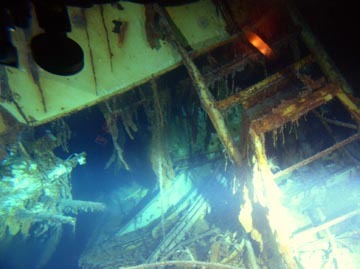 Occupying the other crew space would be Trevor Montgomery (“Monty”), an Aussie making his second MIR dive. We were scheduled to be put over the side early the next morning for our 15 hour sojourn to the depths. We were going to dive Bismarck on June 6 th….. D-Day! What could be more fitting and appropriate? I couldn’t wait! We spent the rest of the day climbing in and out of MIR 1 reorienting ourselves to these unique undersea vehicles. Anatoly quickly directed our attention to the newly painted signage on the exterior of the MIRs…. “Russian Academy of Sciences….PP Shirshov Institute.” Long overdue, I thought. The public’s brief glimpses of these subs usually occur only in news coverage and Jim Cameron’s Discovery Channel epics on Titanic. In fact, because little or no mention is ever paid to the Russian benefactors in the Discovery Channel specials, one comes away with the sense that James Cameron owns and pilots the submersible which is clearly not the case. Once inside, it was obvious that the reassembly of interior electronics was still a work in progress. Some of the electronics had been moved since my last dive in 2003 and some new equipment had been added. Still, lots of panels were open and lots of wires had yet to be connected. We didn’t dally long for the Russian technicians had a full night ahead of them. Monty and I assembled early for a light breakfast on the morning of dive day, suited up and ready to go. Anatoly came into the Officers Mess shortly thereafter and summoned us for a short meeting in the conference room. His grim look foretold that something was amiss. In the course of testing the night before, the Russian techs had encountered some glitches and although they had worked feverishly to correct them within the dive schedule constraints, it hadn’t happened. Rather than push to meet the schedule, Anatoly had decided to scrub today’s dive… a decision that both Monty and I heartily concurred with, this being our deepest of dives in a vehicle that not been back in the water since it had been completely taken apart and only recently put back together. As it eventually turned out, it became necessary to remove much of the new electronic gear and reinstall the old equipment to get over the hump. Although the historic significance of diving on D-Day was lost, our anticipation for this adventure was not. 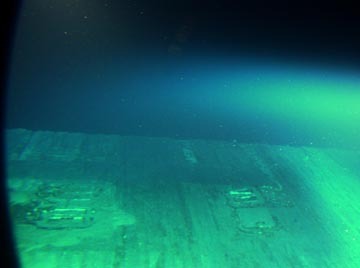 We entered MIR 1 the following morning and slipped under the surface just after 10 A.M for our almost 3 hour trip to the abyss containing Bismarck and many of her crew almost 16,000 feet below. The Bismarck had rolled over near the surface, shaking loose its massive gun turrets and much of its bridge. These cascaded to the bottom, impacting in upside down positions. 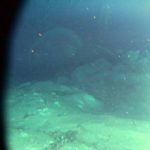 The ship followed and impacted on an undersea mountain in a right side up position, skidding down stern first from the top of this seamount for approximately 1000 yards, digging a furrow in the bottom approximately 100 ft across and 20 feet deep in the process. Its hull dug deeper into the bottom clay as it reached the end of its slide, causing its stern to jackknife, moving tremendous amounts of bottom clay ahead of it, much in the same manner as a child does with its arms when making a snow angel in freshly fallen snow. The Bismarck lies now basically intact save for its missing gun turrets and bridge. 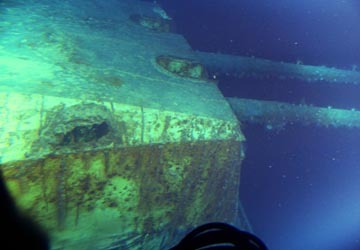 Also approximately 34 feet of its stern has been neatly broken off, either as a consequence of its impact with the bottom or the forces of its sinking. 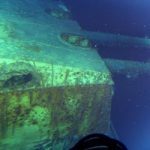 Although not apparent until one gets both close enough and low enough to Bismarck, the bottom of its hull is literally ripped away below the steel armor belt that stretches almost the full length if its hull. There has been much speculation that the Germans scuttled the Bismarck with internal explosive charges rather than allow their ship to fall into the enemy’s hands. Although an attempt to scuttle may have been made, from my observations the bottom damage that is now apparent was more likely the result of a combination of this attempt and the ship’s impact with the bottom….with major emphasis on the latter force. Having made four deep ocean dives, it becomes easy to become complacent as to the potential dangers associated with such activity. Little things however bring reality home and that is a good thing. As we approached the ocean bottom, Anatoly switched on the color display screen in the MIR connected to its depth sounder. At 600 meters from bottom contact , the display began to etch a rolling horizontal line at the bottom of the screen depicting the approaching seabed. As we continued to descend, the display continued to monitor the approaching bottom. At 300 meters, Anatoly flipped switches activating the high pressure ballast pump to expel some to water ballast taken on at the surface to allow for our descent. 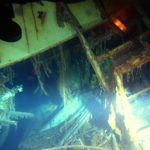 By doing so, the negative buoyancy of the MIR would be lessened, slowing our rate of descent and thus avoiding a hard impact such had occurred with the Bismarck almost 65 years previously. The pump began making its familiar reciprocating chugs but the associated gauges made it clear that little if anything was happening….. The rate of descent was not changing!. More switches were flipped….. Nothing. Under his breath, Anatoly announced “There is a problem.” The bottom was getting closer and closer and we were not slowing down! Not to worry….. There are many back up systems in such a situation. A back up ballast pump can be activated… tried, still nothing. Although I was never told of the source of the problem, my plumbing background would lead me to believe that a joint in the ballast pump piping system was leaking. At the tremendous pressure existing at such depths, it doesn’t take much of a leak in a pipe joint to render pumps useless. The pump may have been pushing the required amount of water out, but the pressure existing outside the pipes can replace most if not all of the expelled water if a leak is present. Sort of like taking three steps forward and two steps back. Still, lots of other remedies are at hand. Release the emergency permanent ballast composed of steel shot held in place by an electromagnet (handy in case of an electrical failure)…. a magnet releases ballast and sub shoots to the surface. External components of the MIRs are held in place by explosive bolts (more useful in situations of becoming snagged in wreckage, etc. )…their jettison dramatically increases positive buoyancy. But our saviors that day were the trusty side thrusters of the MIR. These two hydraulically driven rotating propeller assemblies can be utilized to provide thrust in any parallel direction to the MIR fuselage. In the final meters of our descent, Anatoly deftly rotated these thrusters down and was able to cushion our meeting with the bottom. Still, our stern first landing was not without a jar. We sat there for a few moments, Anatoly again going through the switches to cast aside any possibility of error. To my pleasant amazement, the ballast pump had made some headway and we were moving toward neutral buoyancy. 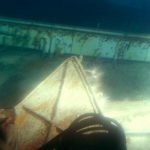 Deciding that there was little more we could do with the ballast pump situation and that we were not in imminent danger, we decided that we should strike out for the wreck which lay ahead in the darkness beyond the range of MIR’s high intensity lights. Anatoly activated the powerful articulating stern thruster and we immediately made a left turn. After a few more moments of checking, we determined that the stern thruster was jammed. 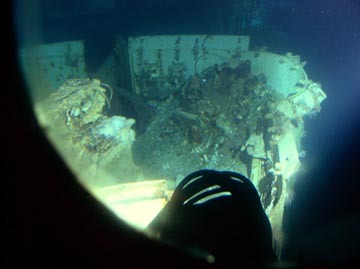 Although the propeller would turn, the thruster was jammed to port, making the traditional method of propelling and steering the sub unusable. An ironic reminder that the Bismarck’s rudders were jammed to port by a torpedo many years before. Again, side thrusters to the rescue. Anatoly reminded us that early Russian submersibles did not have stern thrusters….. only side thrusters for maneuvering and propelling. 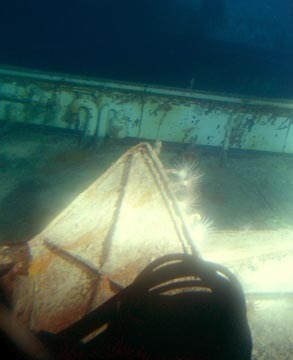 Although slower, we were not in a hurry on this dive, so away we went. Having been to Titanic, I was first struck by the difference in the bottom geology of the two sites. 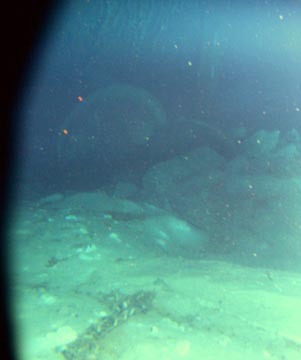 Whereas both appear gray in color, the major difference of the Bismarck site is the absence of the many, many rocks and small boulders that exist on the bottom in the Grand Banks location of the Titanic. The difference is easily explained by the absence of icebergs in the area the Bismarck sank. Calved from glaciers, icebergs carry large quantities of the surface geology scooped up by their glacier parents when they break off as the glacier reaches the sea. These rocks and boulders are dropped along the current induced ocean routes of icebergs as they melt, literally carpeting the bottom below. Not so at the Bismarck site and the bottom composition appears to a composite of fine sand and clay. 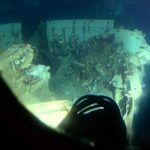 Coming up on the Bismarck wreck was not quite as dramatic as Titanic but I have to say that it was more poignant. 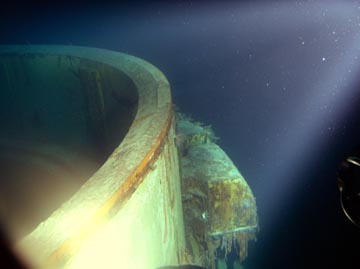 This is due to the fact that evidence of human life is much more immediately apparent at the Bismarck site. Even before its massive hull sides were exposed by the MIR lights, the bottom is littered with hundreds of pairs of black military boots. First impression is that these boots were kicked free by frantic swimmers but like Titanic, the symmetry of pairs brings the reality that most of these were worn by their owners to their final resting place. Even more unsettling, some of these pairs of boots serve as the termination points of the legs of the uniforms worn by their original occupants on the day of their demise. Neatly arranged in their final pose as they each came to rest on the bottom, the memory of these boots and uniforms is one that will remain with me until the day I die…and perhaps beyond. The absolute futility of war was clearly brought home to me on this dive…..Will we, as a dominant race of seemingly intelligent beings ever learn? Some photos are included in this section but I must admit that they do little justice to the impact of this unforgettable experience.